Imagine if you could just share your opinion and make money. How great would it be to sit in front of the tv on your couch, in your free time, and make extra money just by saying what you feel about products, services, and newsworthy topics? Getting paid for having opinions! You’re already doing it directly with your friends and family and even on Facebook or a number of other digital sites, so why not get paid for it? With online survey sites, you have the opportunity to earn a side income by saying what you feel and shaping the future marketplace for products. There really is a market where your voice can be heard through surveys in 2018. In this article, I want to give you a complete breakdown of everything you need to know to make money taking surveys and what you can expect to get paid online. Why Should You Be Taking Online Surveys? What Are The Best Survey Sites To Start Making Money From? Frequently Asked Questions: What Do You Need To Know? Online Survey sites allow you to start making money from performing simple online tasks. If you have a computer, internet connection and some free time that you want to get paid for – you should be taking online surveys. There’s no need for special qualifications or requirements. While they are still called Survey Sites, many of them have branched out to give you lots of different opportunities to earn money. Some of them will even pay you to shop through them. They’re the tasks you were going to do online anyway, and now you can get paid for them. It will be difficult not to become a survey junkie with all these ways to earn cash rewards on the web. But how much can you get paid? You can easily make an extra $75-$100 per month if you use the sites and strategies in this article. For example, Gretchen from the Retired by 40 blog uses just one site to generate $1,205 extra cash per year. All by playing games, shopping and performing simple Google Searches. (You’ll see her exact strategy later in this article). By adding a handful of these sites together, you can start to create a second income for just a small investment of time each day. Heck, that’s just what I’d do with the extra cash. Survey Sites aren’t going to make you rich, but what they can do is provide you with a constant amount of extra cash to add to your disposable income (or put towards your debts). And I tend to make around $100/mo in total. So if you like the idea of earning extra money and you have plenty of times in a week that you can fill with a bit of work, where do you need to go to do it? Many sites use ‘points’ as the currency on their site. These points all have a cash value when you cash out. The amount of points, and their dollar value, changes from site to site, so it’s worth checking the site to find out how many points equals what amount of dollars. In your first 60 minutes on PrizeRebel, you can earn $5 taking a few surveys. Although it’s possible some users will earn up to $8-$10 dollars! Once you pick a survey partner, will need to fill out you profile questionnaire. Being honest on the questionnaire not only helps PrizeRebel match you with the best surveys, but also helps you gain additional survey opportunities. Once you have done that, it’s time to start making money! All you need to do is complete 3-5 surveys in the next hour. In 12 minutes you would gain 263 points which is worth $2.63! All you have to do is spend the next hour working through this list and you can easily earn $5 in less than 60 minutes. New surveys are added daily on PrizeRebel so it’s worth logging in daily and completing any tasks. In this section, you’ll find the 3 best survey sites for you to start making money from. But, what makes them the best? I’ve handpicked only the most tried, tested and proven sites with the best track record, full disclosure. We will take a closer look at sites like Mintvine and Swagbucks. All of these sites will pay you in cold hard cash and not try to make you redeem gift cards instead. Take my advice and read about each site, find the ones that you like, and sign up for them. Then you can head to the next section where I outline how you can make money taking surveys right away. PrizeRebel is THE best survey site in my opinion. I have had lots of positive experience with them over the years, made over $2000 and they pay within 24 hours. You can be paid via PayPal, Amazon, gift cards, BitCoin or direct to your bank account. I like PrizeRebel because they offer a lot of quick hit surveys so you can earn a fair chunk of change very quickly. This is where you’ll get the biggest return for your time and that is why I recommend them first. Makes financial sense to top up your personal bank balance or tackle a bit of debt right? Of course it does, answer questions, fill out a form and get signed up instantly! MintVine has a perfect blend of payment amount and quantity of surveys. It’s not uncommon to earn in the region of $5.00 (£4.50) for a 15-minute survey. It’s simple, user-friendly, and gets good feedback from being part of the Better Business Bureau. So, you know you can trust spending your time here, too. And did I mention all the ways money can be earned. There’s money to be made here. They even run a yearly challenge to see how much money can be made with hundreds of active participants, so there’s no shortage of money for you to get your hands on. 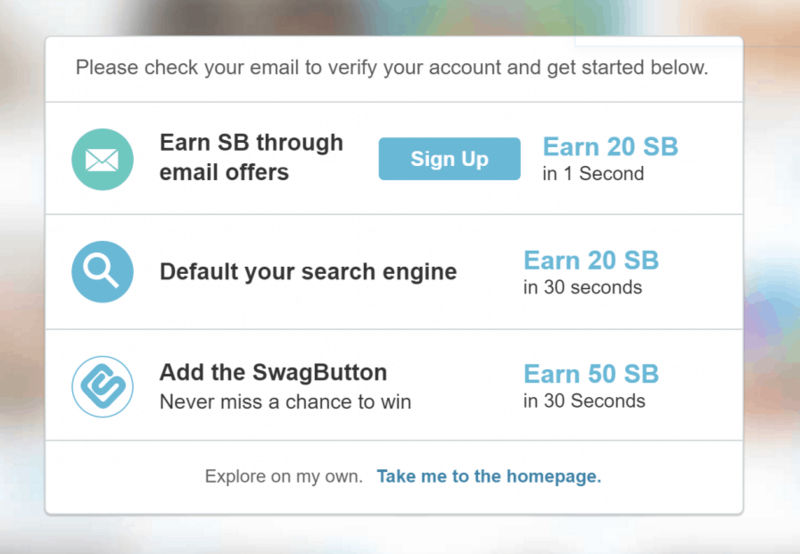 I have had great success with SwagBucks and you will as well! These strategies will help you make as much money taking surveys as possible by choosing the most effective parts of each site. Don’t forget I have only included the best survey sites in this list so focusing on them will help you start to make the most money. Take out single payments or maybe monthly payments, The thing is, with these sites, as the consumer you’re in control. Although paid survey sites will not make you life-changing cash, giving up a bit of your free time can help you save money, pay off a few credit cards, buy that new phone or even just reward yourself with your favorite meal that you can share with your loved ones. Have you ever heard of the compound effect? It’s where you take small, incremental, changes and add them together to create one big overall result. For example, earning $1.00 a day extra doesn’t sound like much, but over a year that’s $365 – a much more handsome sum of money. Think of the saying ‘a pretty penny’. You’re going to be able to make money from. Not all sites offer a points survey every day, and not all of them include great deals, so it’s best to keep your options open. If one site doesn’t look worth your time today, you can swap between sites to another and cash in there. And on the days that all the sites are offering great deals, you’ve got access to an absolute goldmine, so you need to be completing as many jobs as possible to redeem points. A big win which would go straight in my travel fund! So, go ahead and sign up to as many sites as you can and then meet me in the next step. All of these sites have a pay cash out threshold. That means you need to reach a certain amount of points, or cash, before you can redeem them. It’s in your best interest to at least reach this set threshold on the site you’re working on, so you can definitely get paid for the work you’ve done. When you sign up to a site, they’ll give you lots of options to start earning extra points or cash. For example, Swagbucks gives you a lot of options. In 61 seconds you can make around $1.00, and all you’ve done is click a few buttons, before you know it you will have 75 points, then 200, then 500! Explore all of these options when you sign up, on all of the sites you choose, and you can find yourself with a fistful of cash that you didn’t have when you woke up this morning. A nice little cash gift redeemed for the day! Not only that but they’ll also guide you through the entire process to make repeat instant cash. Just sign up and follow the steps – it’s easy! In fact if you stopped reading this article and signed up for SwagBucks, MintVine and CashCrate right now you would make instant money I hope you can remember the pin number for your cash card. Some sites will require you to apply for surveys. Don’t worry; it’s nothing strenuous. You’ll be asked to fill out some criteria that will test whether you fit the product or service. And, then they’ll decide if you qualify as a good candidate. You won’t always need to apply for a survey – some will be offered to you, or be readily available, like the ones below. But the more opportunities you give yourself, the better. But remember, this is the ultimate way to start making money from Survey Sites – taking the surveys that they offer. They’re the most consistent, and most plentiful source of money on these sites. I’d love to tell you that there is an amazing, foolproof, system that gives you $5 surveys every time. Instead you need to check the sites every day for surveys and complete them. Some days they’ll be worth pennies. Others, like on Pinecone Research, will be worth much more. Keep in mind this is a long-term strategy for making money, and it will pay off over time. Just be consistent and focus on the highest paying surveys when they come available. Focus your time and effort on the Prize Rebel site. In 15-20 minutes you can take lots more surveys than you can on any other site. And, while the pay is less per survey, you’ll be able to get a much higher amount done. So where you may only earn $1.00 for a 15-20 minute survey, you may make $1.50 – $1.75 for 20 minutes on there instead. These ways earn extra if short on time. Remember at the start of the article I told you about Gretchen? She makes $1,205 a year from Swagbucks. She performs small, daily tasks that mount up to create a big chunk of money. That’s 110,570 Swagbucks which is at least $1,105 in gift cards or around $100 extra every month. Many of these tasks don’t take effort from you, either. Watching a video doesn’t require any real watching as long as it’s running in the background. You can even plug your headphones in and leave them out of your ears so you don’t have to hear it. And, if you perform your Google searches through Swagbucks you can find yourself earning money for stuff you were going to look for anyway. You’ve just been extra smart and monetised it. These tasks can be performed through multiple sites as well. You aren’t tied to Swagbucks here. You can apply the same to PrizeRebel & Mintvine and any other sites that follow the same system and triple that income. Buying products through your Survey sites can mean not only do you get some products for free, you can also make more money back on them. Here is where you get the most money for the least time invested. He bought an Audible Membership through a survey site at a discounted price of $1 (usually $7-$10). He likes audiobooks and was going to pick up the product anyway. In total, Chris was able to earn $8 from a $2 purchase ($1 to buy and $1 to hold it for the second month), which is a $6 gain overall. Not bad for doing what you were going to do anyway, is it? And, they also give you the option to earn cashback on the other purchases you make online. If you were to shop at your favourite high-street retailers through the options on the site, you can earn points or cash back on every $1.00 you spend. Before you spend online, take an extra couple of minutes to look and see if there is an offer through any of the sites you’re signed up too. Who knows, it could just make you a profit. Okay, I just want to quickly talk you through each of the last points, so you know what you need to do to start making money from Survey Sites. The more sites you’re a member of, the more opportunities there are to make money. Not every site is full of offers and surveys each day, so having more options help maximise how much you will learn. There are lots of sign up offers on each site, so be sure to cash them in. You can earn $20+ in your first few hours just be changing a few of your internet settings and signing up for a few free extras. When surveys are readily available take them and focus your time on the highest payers. If you have to apply – even if you think you might not be eligible – do it anyway. You’ll receive a small amount of points that will give all add up for when you do get onto one of the surveys. Much like Gretchen, find small things to do every day on each site. Search, spend, redeem offers and activate any panel or toolbars to accrue points that will add to your total. It may sound small now, but it’ll make a huge difference to what you can save over 6-12 months. Before you make any purchases online, be sure to check out what offers are being made on your different sites. You could earn cashback, or even make more money than you spend on some of your purchases. In this section, I want to explore some of your biggest concerns and put your mind at ease. Are There Scam Survey Sites? None of the sites on this list are scam sites. All of them have a good track record of paying on time. There will always be people who have a negative experience with a site. So, you will be able to find bad reviews if you go looking for them but personally I love PrizeRebel. But the sites here are all part of the Better Business Bureau, or larger organizations, to ensure they have excellent customer service & are all legitimate paid survey sites. Also do your research on the company and check opinion outpost. There are other sites including Ipsos i-say, Mysurvey, Opinion Outpost, Harris Pole and Toluna that may be worth exploring. This depends on the website. While some sites are forward thinking and pay through PayPal, many of them opt to pay by cheque on the post, not a fast method but it still pays. Will You Be Wasting Your Time? Only if you don’t cash out. While the sites are there for you to make money, they aren’t against you doing the work for free. That’s why it’s important that you always try to hit the payment threshold, no matter how long it takes. When you get paid, it’s not time wasted. Can I Automate The Work? Lots of people ask about if they can get the work done…without doing the work. While it is possible on individual sites, it’s really not worth it. You’ll waste more time and effort setting it up than it’s worth. And, if you get found out, you’ll have lost a lot of time for nothing. Okay, there you have it, that’s everything you need to know about the best free survey sites & how to make the most money with them. If you have spare time, an internet connection and the desire to earn more money, you’ve got no excuse not to start using them. You’d be bonkers not to stop what you are doing and join the online community of members winning prizes, getting a free gift and making money with these popular quality survey companies. Giving your opinions gives them data which makes their job 1000 times easier. It really is money for old rope! There is a high chance of becoming a survey junkie after you see how simple it is to earn cash and top giftcards, simply for leaving a review, watching videos and answering questions on the best survey sites. Volume is key: The more sites you sign up to, the better. Don’t only rely on Surveys: They are the most consistent way to make money, but explore the bigger money options around them too. And if you want to make instant money right sign up to SwagBucks, MintVine and CashCrate right now & follow the steps. Now, it’s over to you – where are you going to start with surveys? That site was a great one, but didn’t warn which countries will be available to use and participant the surveys. It will be nice to add the continents before they signing up. Not wasting their time before it not available to their country. Thanks for your suggestion, I will need to do some additional research on that side of things. Only CashCrate will let you signup. The others will waste your time. Trust me I know I am Nigerian. Great list of alternatives to make money. This would be good for people to earn second income. Thanks Matthew for sharing the article. That is right :) It would be difficult to earn a full time income this way, but it can certainly provide a decent amount of extra disposable income! Hi Matthew. Interesting post and thank you. You don’t say whether these are international or just US-based, as you mention US$ payments. I’m in the UK, so are (most of) these sites also available for UK-based people? This a great post for the people who would like to earn money from the internet without investment. Thanks for sharing. I love it…. Great post. i have not seen anyone really go into detail about surveys. Matthew, thank you for this very helpful post. I know two people who can’t work – this is the perfect way for them to make a bit of extra money. I appreciate all the effort you put into your posts! No problem Karen, I hope it helps them out! Extra $100 helps me to invest in one. I can vouch for Pinecone. They’ve been around forever. I was doing surveys for them around 15 years ago. Those $5 checks would pop up regularly in the mailbox. May sign up for them again, but they only have good surveys that pay decent money every so often. Anyway, just verifying that they do pay for those interested, and the checks arrive within a week or two. Yes Pinecone are one of the leaders but often difficult to sign up to! Thanks Matt for some Extra. I really needed this. As i am planning to buy some new plugins. This will help. You can make a lot of more money from those surveys if you can get people to signup for them. Signup at the survey site that is. Go to offervault and enter those sites in their search box. They only pay around $1 CPA so it’s not all that much, it used to be a lot higher though! I was trying to sign up. Trobled with this one. A very informative post Matthew but I have looked at many of these types of things. The main problem is that none of it is ever relevant to Australia. I can’t give an opinion on products and services that I don’t have access to. Where u showed that 20follars in 15mins one dude say abt that and I am from India can i earn from this if yes wt r the sites I should work on? That is only for the USA, Canada and UK sorry! All these sites are legit? Have you ever tried it at your end? thanks in advance, and you’re awesome! Most of these survey sites don’t work for Nigerians. Please do you know any of which can be a breakthrough for me before the year runs out? I just signed up for inboxdollars, But it was just a waste of time as they only allow users from specified countries only. Let me try my lucky on other sites and see how it works. This is a very useful guide. Thanks for putting this together, it’ll definitely help me improve my earnings from survey sites. No problem Stephanie I hope it does! Is it possible to get money by attending those surveys from India? Thanks for this info and for giving the url’s also. It will help me a lot. Thanks for sharing. Thanks Matthew for sharing the nice information. Is there any way to make online income as full time income? Hello Mathew , could you please suggest the most profitable affiliate for use in uk and us for iphone websites. Excellent article. Informative as well as quality content as always wit your posting. my query is are these surveys profitable for people from Pakistan? and if what should be the payment method? Thanks so much for this list Matthew! I’ve been looking around for sites like these to make about 100 pounds extra a month. I can devote about 30-40 minutes a day so think I will probably hit that mark. I’d be curious how much time most people devote to doing this? Yes you can easily make that across all of the sites! Mint Vine, Inbox Dollars and Pinecone Research are not available in India. That’s sad as they were much better than other that you have mentioned in this list. Thank you for the list Mathew! I have been searching for these website lists! More great insight on how to create alternative revenue streams! Very creative, keep it coming! I live in Nigeria and I have been cashing out on this survey sites for two years now. Thank you soo much for this post Mathew, i have been following your blog for over a year now and have learned so much from you, thank you for all your hard work! Def gonna try ouy some of these sites! I started these as part time job but now I’m doing full time job. There is definite chance to earn more with the list of sites you shared. Thanks Matthew. Hi Ele, glad this has been a success for you! While these sites definitely make some money, their pay is quite low. I think it may be better to just do some tasks instead. Depends on the circumstances. For some people this is a perfect way to earn a bit of extra cash. The best site I found for earning FREE MONEY is QMEE. All you need to do is register to the link below and fill out short surveys and withdraw to paypal INSTANTLY !! and as low as 1p or 1cent which is a bonus !! Hey guys, I am sharing one of the best sites I use every day,it offers free cash surveys,rewards,prizes and much more! Ideal for extra CHRISTMAS spending money etc. Hi, I am on Clixsense. 10$ a week is not a problem. Just take every survey that apears. They are 100% safe. I already got my first 10$ on my bank account. Been also doing paid surveys for quite a while now. And I totally agree that it sure is a great way to earn side incomes. And PayPal transfer is the most convenient payment option there is for me, might be useful as a reference too: https://surveysuzi.com/surveys-that-pay-through-paypal/. Also a huge fan of Swagbucks here for their tons of options and rewards. Signing up to as many legit sites as you can ensures you’d always have surveys to complete regularly. Kudos! Sounds like you have got these survey sites nailed! Thanks for sharing the links. I’ve bookmarked this site for future use. No problem, thanks for the bookmark! We are linked up and I wanted to see if you could help me? I have been involved many years in stock, real estate development and intellectual property ( patents) speculation. I live in Hernando Beach directly on the Gulf of Mexico here in Florida. I’m basically semi-retired. But I’ve recently just noticed how many products I purchase online (almost everything but groceries) and how many people are online or into online marketing. I’ve even discovered how much time I now spend online other than on the road in my industry. It really interests me and I like to find someone that could point me in the right direction into getting online in business and I’m also willing to pay to invest in that person or what it takes to learn the online tricks of the business. As I even know in my business ’s there certain things and ways to do well and the mistakes to avoid. Maybe you could help me in some way in online marketing? Let me know if you have a minute. Lake Development & Investments Inc.
Gaynoco Acquisitions & Holding Company Inc.
Gaynoco Musical & Entertainment Group Inc.